Participants in Today’s Service: Pastor: John Hilley; Music Director: Nate Strasser; Youth Director: Kelly McConnell; Musicians: the Youth Band; Elder of the Day: Liz Beatty; Liturgists: Will Morrow, Owen Coulam, Dara Kurbegov, Kevin McGuire, Grady Vasileveskis, Faith Glover, Katherine McGuire, Jeremy McConnell, Tess Henderson, Jake Henderson, Tyler Bell. This Week is Youth Sunday: All children will remain in worship. The nursery will be available for our youngest friends. SAVE THE DATE: EBPC goes to the Well on Saturday, April 28th from 6:00 pm to 7:30 pm. The Well is a coffee house on Old Hickory Boulevard, east of Target. Everyone is welcome! Nate will be performing with some guest musicians. Men! We heard you! Mark your calendars for a chance to get together. It won’t be over some tired dinner and a speaker but kicking around a bonfire on Friday, April 20th at Larry Wilson's place at 2195 N. Berry’s Chapel Rd. Franklin, TN 37069. The fire will be roaring by 6:30 and good conversation around the fire will follow. Bring your own camp chair and refreshments to add to what we will have on hand. Contact Brian Telford for more information at telford451@gmail.com. SAVE THE DATE: UPWARDS Canvas Painting! On Sunday, April 15, all Upwards kiddos will be painting canvases that incorporate one of their favorite Christian symbols. One of our goals this year is for our upper elementary kids to start telling their own faith story as they grow into creative thinkers and doers of Christ! Upwards will start at 10am on the 15th so that we all have time to finish our paintings! Please make plans to join us for this special Upwards tradition. Parents are invited to view our gallery of artwork at the end of worship on the 15th. EBPC Preschool Begins Strategic Planning Process: During 2018, a group of EBPC church members and Preschool staff will be engaged in Strategic Planning for the EBPC Preschool. After 19 great years of serving children and families in our community, it is a good time to envision our future and build on our strengths. This process will take several months and includes visioning for 2023, Input Sessions with staff, members, and other friends of the Preschool, and the creation of initiatives to maintain an already well-respected program in our community. Please feel free to reach out to any member of our working group—Sheri Vosel (svosel@ebpctn.org), Rev. John Hilley (jhilley@ebpctn.org); Elizabeth Johnson (ebpc.preschool.chapel@gmail.com); and Lavona Russell (lavona.russell@gmail.com)—with your questions or input to this process. Helped Needed at our Partner School! Glenview Elementary seeks proctors for the upcoming state assessments on the mornings of April 17-19 and 24-26. You will be an extra set of eyes in the classroom and will get to chat with students during breaks! If you are available one (or more!) morning to help, please email Katherine Booker at katherine.booker@mnps.org. Thank you! As part of our year of "Getting Connected; Staying Connected" theme, periodically we will hold "Coffee and Chat" gatherings on Sunday mornings before worship. If you have been visiting with the church and would like the opportunity to learn more about EBPC, Pastor John and Liz Beatty would love for you to join them for conversation and refreshments on Sunday, April 8th AND 15th from 9:00-9:45 a.m. If you would like to formally join EBPC, members of our Session will be available on the 15th to receive your request and act upon your desire to publicly profess your commitment to becoming a church member. If you have any questions or would like to join the church but are unable to attend this event, please contact John (jhilley@ebpctn.org) or Liz (aybeatty@comcast.net). NaCoMe Christian Camp | Family Camp: Formerly known as You & Me Camp, Family Camp is perfect for first-time campers or for families looking to grow closer. It is for families with pre-K to 5th graders. It is from June 29th-July 1st. Want to come just as parent and child? Great! Grandparent and grandchild? Join us! Family of 6? We’d love to have you! Any size or combination of family is welcome to this intergenerational camp. 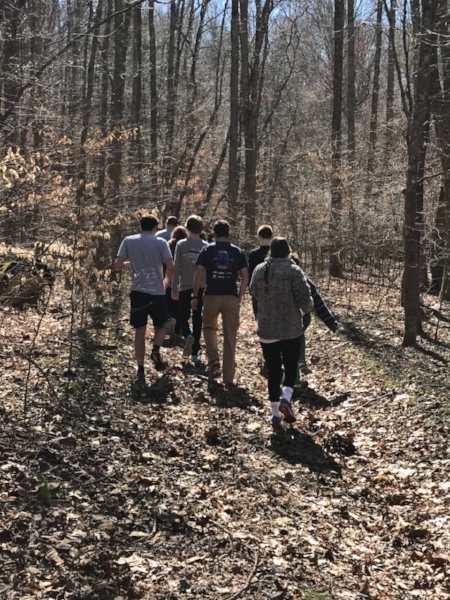 Most activities are designed for the youth and adult campers to enjoy together, although there are times where adults will participate in separate Bible study and activity times. Family Camp encourages independence and allows campers to engage in a positive environment while gaining the experience and familiarity to come back to camp on their own, all while deepening your family’s faith as a unit. For more information go to www.nacome.org. † Prayers for John Jeter, father of Pam Hunter, who has intestinal cancer and had surgery last week. † Prayers for Judy Moser as she continues to recover in Virginia from a recent illness. † Praise God for the birth of Sheri & Jeff Vosel’s first grandchild!